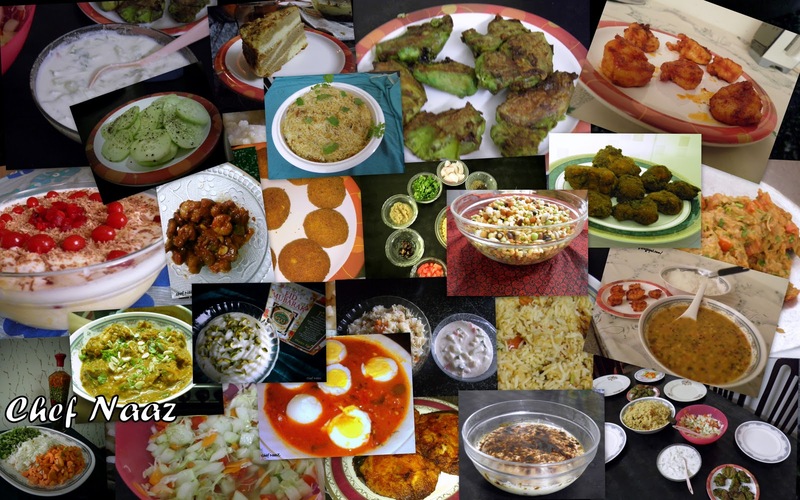 NaazukSpace: My 40 days as the Top chef! My 40 days as the Top chef! Top chef - The title itself makes one proud, Doesn't it? Since i am no exception in the list i too felt proud when i got to know that i would be the top chef at my place in my parents absence. They were leaving to the Holy pilgrimage - Hajj. Being a top chef anywhere is a great honor according to me, be it your own house, a restaurant or a reality show!! For me at this point of time, my own house was my target market, my kitchen was my playground and my siblings, my granny and my aunt were the target audience! And trust me that was no joke! Having my grandma at home and making her love my cooking was the biggest challenge to me, considering her own experiences in this wide area of cooking! Plus she knows how exactly her daughter, i.e my mum excels in the kitchen. So i had this BIG BIG responsibility of pleasing her taste buds. Next comes ' The gang' - Yeah, my siblings! My motivators, my critics. Every child, including myself thinks their own mothers are the worlds best cook. So you see how difficult a task it would be for me to make these 'mom-cooking-freaks' to love my cooking. But i took up the challenge. Yes, it was a Challenge for me! A tuff one! My parents left for Hajj on Oct 14th, the same day my sis was to be back from her school excursion. So my first task was to make this ' mummy's pet' be comfortable in my mum's absence. It was not as difficult as i thought it would be. Alhumdulillah! :) Staying away from parents is so hard for every child but its such a good feeling to know that your younger siblings don't mind being away from parents when their elder sister is around! :) And to me it was the vice versa. Alhumdulillah, the 40 days went by smoothly just because i had my granny and my siblings around. So once i started my 40 days journey into cooking, i had to start with waking up early!! A thing which i wouldn't normally do. My sis used to leave to school early in the morn so i had to get up to give her breakfast and pack her off to school along with her tiffin. Next it would be the college going bro and sis's turn to get ready. By 9 a.m they both would be off too. And then i would think of having a short nap. But.. my hubby lives in NY!! It would be night for him and yippeee time to chat. Sleep can take a backseat :p Once he would be off to sleep, i would start my daily chores and then off to the kitchen. It was the first Eid we celebrated without our parents being around and we missed them terribly! And to top the boredom , it rained on Eid, so we could not go out too! But now its all fine.My parents are back from hajj :D They had a marvelous time during their pilgrimage, Alhumdulillah! :) I pray to Allah (s.w.t) to give all of us a chance to do hajj soon too, Aameen. So at the end of 40 days, i can say i have fulfilled my responsibility well because yesterday i heard my siblings telling my parents about how i cooked and how they all feasted on it. My happiness knew no bounds! LOL! I am elated to know my cooking has been highly appreciated and i look forward to making more people and their stomachs happy! As always, I was smiling while reading. Simple pleasures are just so amazing, aren't they ? A new blog, can't wait to read it.